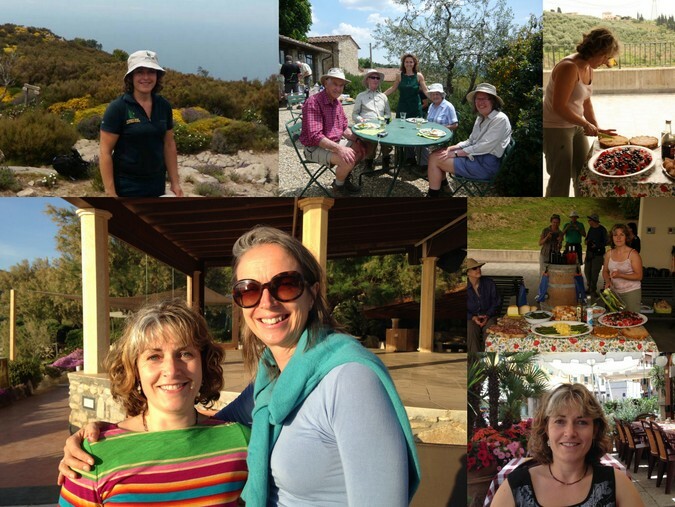 At Hedonistic Hiking we are lucky to have a great team of Tour Managers who support us on the tours in Italy. They are all friends of ours who have worked in the tourism and hospitality industries for many years and we thought it would be interesing for our guests to get to know each of them a little better. After all, these are the people who will make your hiking holiday both enjoyable and memorable. Cinzia grew up in the Aosta Valley in the mountainous northern most corner of Italy in a little village called Valtournenche. She studied Forestry and Environmental Science at University in Turin but almost immediately began a career in tourism. How did you meet Jackie and Mick? I used to manage a Residenza d’Epoca near Siena and it was close to where Jackie and Mick live in Italy. We got to know each other well and then when Hedonistic Hiking started I did some tours with Jackie in Tuscany and Piedmont. What is your relationship with England? I first arrived in England in 2003 when my Italian partner at that time moved across to work there but, at that point, I had no English. But I did speak fluent French alongside my Italian, so I learned the new language quite quickly. Now I am married to an Englishman, James, and am living in Heathfield not far from Eastbourne on the South Coast of England. We were married in 2009 in my village in Italy and our son Carlo arrived in 2012! Together we run a Deli in Heathfield called Cuculo (the Italian word for Cuckoo) which specialises in cheese, wine and chocolate. We have over 100 fantastic cheeses from the UK and Europe and we also do outside catering for local events like weddings and birthday celebrations. Twice a month we host Italian evenings in the shop, on the first and third Thursday, serving antipasti, main course, dessert, coffee and wine for £18 per head. The evenings are great fun and a good way to get to know people in the area. Is food and wine your greatest passion? Yes of course – especially cheese! But I also adore walking and skiing and I love to be outdoors and in the mountains – where I grew up. James also loves walking although we don’t always have as much time for it as we would like with a small boy and a busy shop! We would love to return to Italy to live at some point. My parents long to see their grandson but they could do much more of that if we were close by. There is something about the Italian way of life which remains very attractive to us both and our son could be completely bi-lingual and comfortable in both cultures. Cinzia’s Deli in the UK has a website at http://cuculo.co.uk and their phone number is 01435 862596. You can follow them too on Facebook!